Clear Focus . . .
... is primarily for Christian school educators, but I believe this is a must-read for every single Christian. I was both convicted and challenged in my everyday walk with the Lord. ... helps us to refocus on "who" so that the tyranny of "what" does not rob us of the joy of ministry. This is a must-read for anyone ministering in Christian schooling. 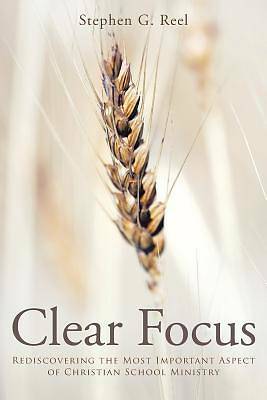 Clear Focus encourages and equips Christian educators to regain vision, purpose, and fulfillment in ministry. With a passion for discipleship, Stephen shares rich insights through compelling stories and biblical applications. He also draws on his experience from two tours of duty in the United States Marine Corps. In a world full of distractions, maintaining focus can be difficult if not impossible. When we focus intently on "who," we begin to escape the tyranny of "what," which steals the joy from our lives and service. Jesus perfectly modeled this for us. Follow Him through any day of His ministry, and you will see His focus is always on a who. Ours should be too.